Here’s a diagram I drew last night. This works for me as a symbol of what health care should do. Most treatments are directed at repair. Dilating constricted airways, reversing spasm of arteries, killing infecting organisms etc. But we only become well again by recovering from an illness. If we have an infection then an appropriate antibiotic might kill the bacteriae but it’s our body’s processes of healing and recovering which restore our tissues and our whole beings to health. The processes of recovery are not so well understood and very few medical interventions claim to stimulate or enhance recovery, but we see reports like this which show that the patients’ emotional state influences recovery for example and some research has shown that the physical environment in which a patient is nursed influences recovery. In other words, recovery is not about just dealing with the disease, recovery is about addressing the whole person in the context of their environments. Finally, after recovery, can we do anything to reduce the chances of this person falling ill this way again? Can we increase their resilience? So much of preventitive health these days is a technical fix – drugs – drugs to lower blood pressure and cholesterol for example – but the best way to be healthy and to stay healthy is to be more resilient – and that involves not just the physical body but the whole person in the context of their life. Not so much is understood about resilience and very, very little exists in health care to specifically address and enhance an individual’s resilience. Well, that’s not good enough any more. 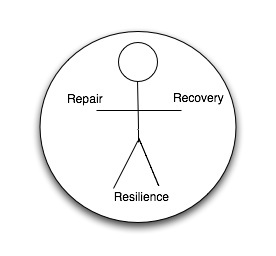 We need more research to understand the processes of recovery and resilience and we need to ask the question of health care – how does this intervention address the patient’s needs for Repair, Recovery AND Resilience? And if the intervention ONLY addresses repair, then what else are we going to do to address both Recovery and Resilience? Because without addressing these needs we are fighting a continually losing battle of repeated repairs. There’s one final element to this little drawing. The circle around the person. This represents understanding that we need to address a whole individual within the context of their life, and also represents that a person needs cared for by a circle of carers. Health including recovery and resilience is influenced by that complex network of individuals – professionals, friends and relatives who surround the person. Fundamentally, though, the circle represents CARE – nobody really gets better unless someone cares for them. All health care should be delivered by people who CARE. Blind Light1, originally uploaded by bobsee. 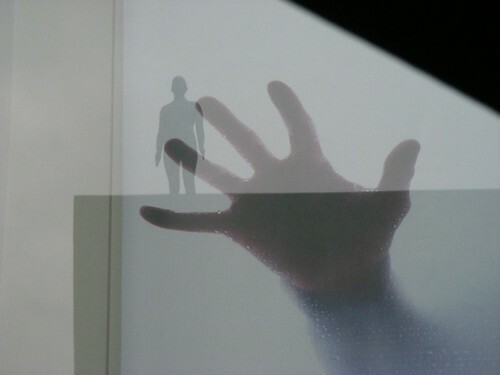 I went to the Hayward Gallery in London last week to see Antony Gormley‘s Blind Light Exhibition. I’ve always been enormously impressed with his work, ever since I first saw The Field in Inverleith House in the middle of Edinburgh’s Royal Botanic Gardens. This is a fabulous exibition. It really makes you experience the issues of separateness, of how we all live all lives inside our bodies and how we connect from there to the outside world, how we fit and how we change the world we live in. The exhibition starts as you walk to the Hayward which is on the South Bank. On the buildings far and near you begin to become aware of standing figures. These are all casts of Antony Gormley’s body. The more you see of them the more you see of them! Echoing each other into the distance, some near and looming large, some tiny and in the distance, and always, always they make you appreciate the scale of the urban landscape and the scale of a single person. Do we already possess all we need to stop feeling the world as the sound of footsteps and the ache of our backs and to look up – to the woods and the hills and the oceans that stretch out in their immensity, just waiting to be seen? There are loads and loads of interesting, educational and entertaining videos of presentations and talks. Start here. This is a talk by Frans Lanting, a wonderful nature photographer. It’s a slideshow of his own photos that he’s put together and narrates to tell the story of LIFE, of evolution, of how LIFE is about continual becoming (see that “becoming not being……” byline at the top of my blog? You can see why this talk appeals to me). The photos are just stunning. It’s amazing what you see when you look…. Now, to you and me that might not be a surprise but, strangely, to these surgeons it was a shock. You know why? The surgeons see themselves as technical fixers. In this case they were fixing hips and they were assessing how well the new hips worked. But they are being confronted with the fact that the hips in question are inside people and people are a lot more complex than just the bits of their bodies. “The number one issue is recognition – we need to acknowledge that there’s more going on with patients than what current clinical tests tell us,” he says. OK, I’ll let the “super” and “sub” bit connected to the “specialists” go for the moment but do we really need social workers and psychologists to help patients recover? Because surgeons don’t know how to address a patient’s issues and feelings? Please, let’s recognise that people are always more than the sum of their parts and that every health care intervention should take into consideration the whole person, not just the wonky bit! Recovery, true recovery, from an operation is a complex phenomenon. If we don’t recognise this we are in danger of wasting a lot of time and good effort only doing half a job. Every surgeon and every nurse on a surgical ward should be able to address and care for the human needs of the patients in their care. By the way, just what is a “super subspecialist”? Someone who only has the skills to deal with bits of people? Agenda for Change, or Agenda for Resentment and Despair? The NHS should be a people focussed organisation – focussed on the patients and those who deliver the health care. Targets, budgets, managerial processes, should all be measured against the impacts they will have on people. Please, can we have a health service that cares, that really cares about people? We’re all different. We cry for different reasons and in different circumstances. Sometimes it’s good to cry. A Scottish word for crying is “greeting” and there’s an old saying that “a good greet” will make you feel better. There are a lot of things that make me cry. I cry at movies, at songs, at the painful stories I’m told. I cry when I’m sad and I cry when I’m happy. I cry when I’m overwhelmed. It can feel good. Here’s a fanvid I found on youtube that made me cry. I find it very moving. Maybe if you’re not a Lord of the Rings fan like me, or you don’t like this kind of music, it won’t work for you, but maybe it will. Whether it does or not, what works for you? What do you watch or listen to or do to have “a good greet”?